Rare Mediums - Well Done? That depends on what you like in your acoustic guitar strings. DR is most widely known for their electric instrument strings, and has rightly earned praise in that marketplace. I've been playing the Rare's for a little while now - let me tell you what I've learned about DR's Rare acoustic strings. DR proclaims they use more metal-per-gauge than comparably-gauged strings from other manufacturers. The Rares feature a hexagonal core (unlike DR's round-core Sunbeams), and are designed for lower tension, a warmer, louder tone, and long string life. Warning - read the actual string gauges on the package or on DR's website before you buy. DR's Medium gauge strings run from .012-.054, which is comparable to other manufacturer's light gauge sets. If you're expecting comparable feel to brands you're already playing, go up a gauge with DR's strings. The gauges DR offers run up to Medium-Heavy, which is comparable to most other makers' medium gauge. I pulled my 1990 D-41 into service for testing - its LR Baggs I-Beam pickup allowed me to explore the Rares' amplified side. My Rares earned good marks for longevity, and I can vouch for their carrying what feels like lower string tension. The Rare Mediums (anyone else thinking about a steak?) actually felt like they were carrying lower string-tension than comparable light-gauge strings from other manufacturers. That lower tension may have been a little problematic when it came to waiting for the strings to settle in and stay in tune. I "settled" into a routine of tune, stretch, and wait. I would allow at least a full day before counting on the Rares to hold their pitch, so watch out for last-minute string changes!! Once my Rares were settled in and staying in tune, and while they still had their new-string "edge" to them, I noticed their sustain fell short of the Sunbeams. My D-41 didn't have as much of its signature chime and ring, even with new strings. It also didn't have as much volume and presence, and sounded a little muted when compared to the Sunbeams or Martin SP's it was wearing before. I did find the Rares warm in their overall tonal balance. They also made left-hand effects, like bending and vibrato, easy to achieve. 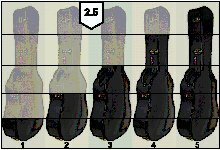 The DR Rares were very comfortable to play, but fell short in the volume department. Is this a bad thing? Well, if you're using your acoustic strictly as an acoustic, I would say yes. If you're playing plugged-in, or using a microphone, you might not notice the lack of volume and projection as much. When I plugged in, I just nudged the volume control up a tad more. My D-41 is long-scale, and I would imagine DR Rares on a short-scale model as carrying even lower tension and producing less volume than the competition, and requiring a lighter and/or more sensitive touch. Players who regularly go back-and-forth between electrics and acoustics, or who play plugged-in most of the time, might like the comfortable feel, and not notice the DR Rares' lower acoustic output. If you like to bend, the Rares will work with you. The DR Rares' longevity should be a plus for everyone - DR's coated string success has evidently rubbed of on their non-coated strings, giving them a good life-span. Since I'm primarily playing acoustics that aren't plugged in, I would prefer more volume from my strings, and would choose the Sunbeams over the Rares. Considering their lower volume and lack of presence, along with having to wait overnight for the strings to settle-in and stay in tune, I'd give the DR Rare strings a Caseworthiness rating of 2.5. Did you find Tony's DR Rare Strings review helpful? Used DR Rare acoustic guitar strings before? Rate it now or read what other customer had to say.